The holiday season wraps up with Three Kings’ Day as we start off the new year! Read on to find out about this and more in this week’s Disneyland news. 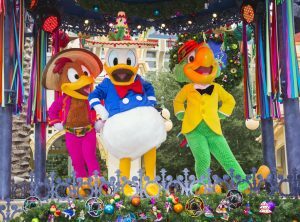 The kids are heading back to school as we bring the holiday season to a close, but first, Disneyland is celebrating Three Kings’ Day through January 8. El Día de los Reyes Magos is being celebrated over at Paradise Gardens, and features traditional displays, treats, and children’s activities. It coincides with the end of Disney’s ¡Viva Navidad! and Festival of Holidays at California Adventure, which includes the Festive Foods Marketplace, a collection of kiosks serving small bites of all manner of seasonal food and drink. You can check out some edible highlights here. 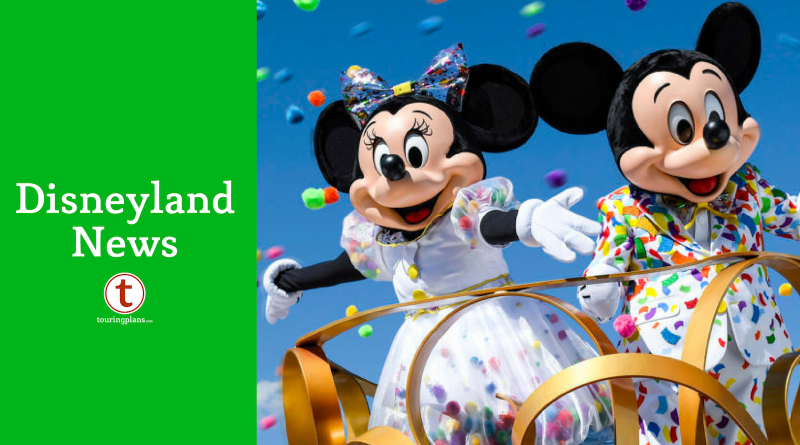 If you’d like to experience any of these special events or the holiday versions of Disney’s parades, evening shows, and most holiday attractions, this week will be your last opportunity — all special holiday events and conclude on January 8! Looking ahead, Disneyland’s Lunar New Year festival starts on January 25! More details to come, but go ahead and get that on your calendar now. You’ll see a couple more days of holiday crowds before the heat map drifts back to more palatable numbers. 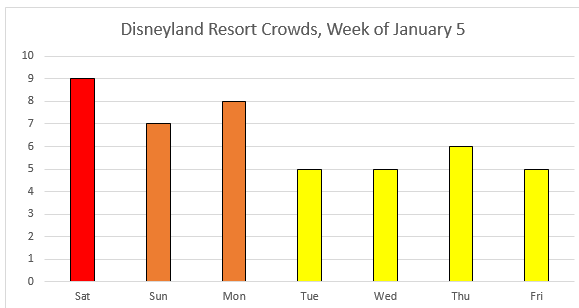 We’re predicting Saturday to be the busiest day, with crowds dropping off significantly starting Tuesday. 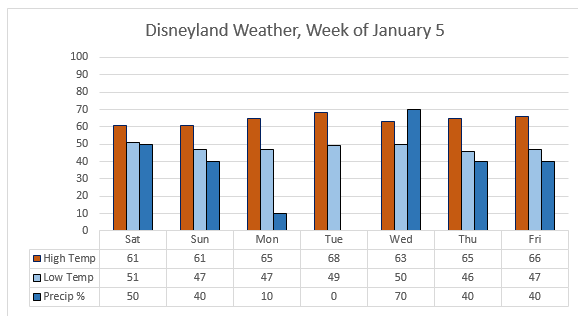 This is the rare Anaheim forecast that includes quite a bit of potential rain, with there being at least a chance of rain every day, in addition to chilly temperatures by Southern California standards. Dress accordingly! After the weekend, Disney’s show schedule is significantly reduced–there are no shows at all playing on Wednesday and Thursday, and only Fantasmic! showing on the days when there are shows. Detailed show schedules, including smaller diversions like The Disneyland Band can be found here. Passholder blackouts ease up some this week. 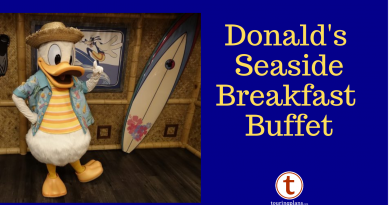 Everyone other than Signature Plus Annual Passport holders are blocked out on Saturday, and Southern California and Southern California Select Passholders are blocked out on Sunday, but there are no other blockouts in effect for the remainder of the week. For those of you buying tickets as day guests, single-day tickets are Peak Price ($135/$127) Saturday and Sunday, Value Price ($97/$91) Monday through Thursday, and Regular Price ($117/$110) on Friday. Early entry is back to normal this week — the parks will open one hour early for eligible guests at Disneyland Park Saturday, Tuesday, and Thursday, and at Disney California Adventure Sunday, Monday, Wednesday, and Friday. Resort guests can take advantage of these hours every day of their stay for Extra Magic Hours, while guests eligible for Magic Mornings can use that benefit one day at Disneyland Park only. Full park hours can be found by clicking on each date in the Crowd Calendar. With the holidays in the rear view mirror, Disneyland will begin refurbishing more of its attractions. At Disneyland Park, Astro Orbiter and Haunted Mansion are both offline as of January 7 (with Mansion set to return on January 18 in its normal format). Looking ahead, its a small world will remain open for another couple of weeks before its holiday overlay is removed, and is slated to be offline from January 22 through February 1. Over at Disney’s California Adventure, Grizzly River Run will be undergoing its annual cool-weather refurbishment starting on January 7, 2019. World of Color also remains dark until further notice. With Disneyworld getting an updated 2019 crowd calendar, do you expect Disneyland to have a revised calendar update as well?